Seems like Castle should be next, unless MMV was it (which if probably the BEST Castle set released in the last decade, if not ever). I would not mind seeing a 100+ Castle set though. I will jump on this bandwagon and say....."yeah". 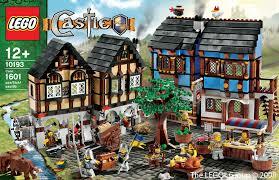 Wasn't the Medieval Market Village one of these factory sets, or was it released as part of the normal castle line. The more I think about it, I guess the MMV was a Factory/Collector set if you go by the 1XXXX numbering system. However, it did not come in the Factory/Collector style box. Either way, I will repeat, the MMV is the best Castle set imho. I agree, it could be a great source of MdStone bricks! This is quite an interesting topic, but before I write down a wish list of my own... What is this "imperial ship" that has been referenced? I may be behind in times, however, I do not think I have ever heard of such a thing until now. Can anyone shine some light on this? Thanks. BrianofBrick06 wrote: What is this "imperial ship" that has been referenced? I may be behind in times, however, I do not think I have ever heard of such a thing until now. Can anyone shine some light on this? Thanks. I too would love to see another "high end" Castle set. The MMV was great and if I can ever squeeze it into the budget I am going to try to get a second one. An actual castle would be very nice though. More solid looking construction with the features one would expect on an actual castle (like a gatehouse). I am sure it would be more than $100 if the castle has any real size to it though. I suppose a cost compromise would be to make it a small fort and not a vast castle. Tyrant wrote: An actual castle would be very nice though. More solid looking construction with the features one would expect on an actual castle (like a gatehouse). Ah yes. This is indeed the dream of many castle fans. I think a large bucket of bley bricks, with arches, wooden doors, chains and sloped roof tiles (red or black) would be enough for any castle fan. Just make the amount of bricks HUGE. The only one on that list that might be misplaced is 10176 King's Castle, since I'm not really sure if that had AFOL's in mind when it was released. It was sort of marketed as a re-release of 6090 Royal Knight's Castle, but probably had more in common with 6091 King Leo's Castle (which was not a huge hit with castle fans). I think this one was only available via S@H, though I could be wrong-- that and the set number are the only other things pointing to possibly being AFOL-targetted. Most of those were rereleases and the Chess set really isn't a set. Out of all of those, I would only consider the MMV to be a Factory/Collector set. g2 wrote: Ah yes. This is indeed the dream of many castle fans. I think a large bucket of bley bricks, with arches, wooden doors, chains and sloped roof tiles (red or black) would be enough for any castle fan. Just make the amount of bricks HUGE. I could go for an idea like that. If they need something more definative, perhaps a Castle Creator set along the line of the larger Creator houses? I am sure if they use the types of parts you list, they can come up with 3 different models. Username wrote: Most of those were rereleases and the Chess set really isn't a set. Why wouldn't you consider the giant chess set to be a set? There's a snowball's chance in a supernova that a parent is going to buy that for their kid given the $200 price, so I can't see NOT counting it as a collector set. As a "Factory" set, sure-- but it's definitely a collector (IE AFOL-targeted) item. And I'm puzzled as to why you wouldn't think it would be a set. Perhaps if it included some non-LEGO elements like the picture frames, kitchen utensils, coin bank, etc. But it's 100% LEGO-- I don't even recall it being glued, although maybe the 2x2 tiles were glued to the board? I'm forgetting without it in front of me. The re-releases (Guarded Inn and Black Falcon's Fortress) were definitely Collector sets, though-- in fact, that was pretty much the point. They weren't released for retail sale (hence the black-and-white box for the Guarded Inn to save money), and were only available online or via S@H. Definitely intended for collectors. The 3739 Blacksmith Shop was an oddity. It again wasn't released for retail sale, but it WAS designed by a fan-- which means that it was really the first LEGO Factory set. It was also "villager" themed, JUST like the MMV. The only real differences between the MMV and the Blacksmith Shop are the price point ($40 vs $100-- neither of which are out of range for kids' sets, unlike UCS sets or the Giant Chess Set) and the fact that the Blacksmith Shop was designed by an adult LEGO fan. So, in some regards, the Blacksmith Shop was even MORE of a "Factory/Collector" set than the MMV was. I can't see how in good conscience you could possibly NOT consider the Blacksmith Shop to be a "Factory/Collector" set. Username wrote: Out of all of those, I would only consider the MMV to be a Factory/Collector set. I could see taking the 10176 King's Castle off the list. Its place in being a collector set is only held on by the fact that it was touted as a quasi-re-release (it wasn't anywhere even close), it has a 10xxx set number (indicative of the "AFOL-targeted" sets), and it was never available retail. But realistically, it had about zero collector appeal. The KK2 emblem was only on the stickers, it bore little resemblance to any sets to be deemed a re-release, it didn't contain any really unique parts, and it wasn't "different" (like being a village set or something), it was just yet-another-castle. It might have been intended as a collector set, but it missed the mark, if so. If you simply want to stress how much more you love the MMV compared to the other sets, that's all well and good-- I agree that the MMV really hit the AFOL Castle "Collector" market square on the nose, compared to the others on the list which weren't as good comparatively. I certainly agree that the MMV is in a class all its own thanks to its quality. The MMV was fantastic, a quandom leap in design and content. It filled a definate role and answered a lot of fan wish list items. The giatn chess set proved that TLG can make a super high part count high cost castle item. So now lets combine the concepts of hugeosity<tm> and great design with what is the corner stone of the castle theme, castles! Lego answered us once with MMV, and again with imperial ship, now hut us baby one more time! Miss Spears video optional! I am all for a huge 14+ castle set with thousands of pieces as long as it is designed more historically accurate than some of the more recent castle designs. From what I could see from the photos I think the new Imperial Ship design looks great! This should make pirate fans very happy.